Think of them as your new pets. Your best friends. Your companions. You know, the kind of companions that might sting you – and then fly away, leaving their guts and stingers behind. Go ahead, scoff. But Noah Wilson-Rich, the founder of Best Bees Company, transports tens of thousands of honey bees to hives across the greater Boston and Cape Cod areas. He considers them his pets. 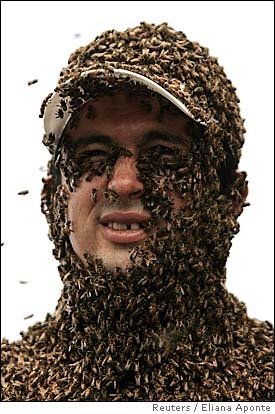 In fact, he’s received so many bee stings over the past five years that he barely notices them anymore. Noah’s organic beekeeping service is the only of its kind. He develops and installs honey bee hives in gardens and on rooftops in urban habitats and revisits them every two weeks. The proceeds from thankful hive-owners contribute to Noah’s development of vaccines to help bees better survive the winters and avoid diseases. Bees weren’t always Noah’s best friends. As a kid, he was terrified of bugs. Below, he explains his connection with them – as well as the science behind the “disappearing bees” phenomenon. Plus: you’ll never guess what wallet item he uses to remove stingers! Job description in one sentence: I deliver, install, and maintain honey bee hives for gardeners and property owners and the greater Boston and Cape Cod areas to raise money for my research to improve honey bee health. Where did you learn about bees? I helped manage honey bee hives at the veterinary school at Tufts. I’m also a 2007 graduate of the Bee School at the Essex County Beekeepers Association in Topsifield, Mass. I have a mental image of students dressed in black and yellow, buzzing around the classroom. I actually thought it was only gonna be me and a couple of weirdos in the class. But there were 80 people enrolled – all regular, everyday people who just wanted a little piece of nature in their lives. What sparked your interest in honey bees? Initially, because of my background in medicine, I was interested in learning how bees could resist diseases. There’s an innate connection between humans and honey bees that’s existed for thousands of years. Coolest thing people don’t know about your job? Watching honey bees is extremely relaxing. Hive owners just sit with a cup of coffee, watching the bees bring in pollen and nectar. It defies the common Omigod, bees! I’m so nervous! mentality. You’ve never been scared of them? The beekeeper suit is like an invincibility cloak – it gives me confidence. But I still get stung regularly, which is never fun. What does the suit look like? 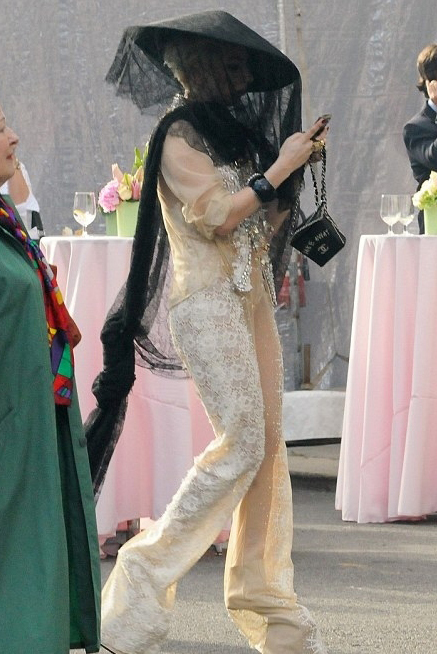 It’s a white onesie jumpsuit with full arms and legs, and at the neck there’s a zipper attached to a veil. The veil is mesh that surrounds my head and has a hole at the top made of harder mesh. It sits like a safari hat. Why you should care about honey bees: Ecologically, they help plants reproduce by transferring pollen, which contributes to the fruits and veggies that humans consume. Economically, the estimated value of all the crops they pollinate around the world is about $15 billion annually. 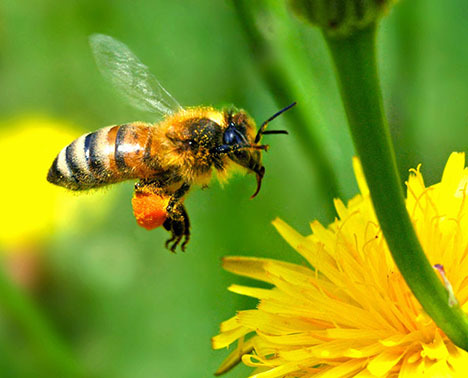 If honey bees are less available, costs of produce pollinated by honey bees will rise. We’ve already seen that with almond products. Number of honey bees in each hive: Tens of thousands. Number of bumblebees in each hive: About 100. Tell me about the “disappearing bees” phenomenon. Just around 2006, when I started working with bees, news started popping up that they were dying from colony collapse disorder. Basically, that means thousands of older foraging bees were just vanishing from their hives – there were no dead bodies to examine what killed them. The younger and baby bees were still there, the queen bee was still laying eggs, and the hive looked healthy, with plenty of pollen and nectar. Why is that so bad? Without [the older foraging bees], younger bees are forced to collect pollen before their immune systems are fully developed. So those younger bees would bring back disease agents and bacteria to their hives – or so we think. How do you explain the disappearing? Researchers are still furiously figuring it out. Three leading hypotheses are pesticides, poor nutrition, and disease. The strongest argument is for disease: when fungi and viruses infect the hive, it collapses. Is there a way to help? Oral supplements and bee yogurt filled with probiotics can help strengthen their immune systems. Immune boosters are added to a mixture of water and pollen, forming a peanut butter-like consistency. The goop is shaped into paddies and placed into hives for consumption. Hardest part of the job: Although I patented a vaccination for these diseases, it’s been impossible to get funding from grants. Best Bees Company is a way to raise money for my research. Are your hive installation services in high demand? Right now, I’m managing 32 hives. I check on the hives once every two to three weeks, so I’m constantly traveling from Gloucester through urban Boston down to Cape Cod. Charge for a honey bee hive: $975 for the first year, which is all-inclusive; $750 to $850 for each subsequent year, depending on location. We’ll replace the bees at no additional cost if they don’t make it through the winter. I’m assuming these aren’t killer bees, then. They’re totally non-aggressive Italian bees. If you’re not a flower, they won’t care about you. Killer bees are from tropical habitats like Africa. Aggressive traits in honey bees were favored over time in tropical habitats because of selection pressure from predators. Benefits of a honey bee hive: The honey is delicious – just take out the frame from inside the hive, which will be covered in honey and capped with wax. Remove the wax, let the honey drip into a pan, and dip a spoon in. No processing is required since we don’t use any chemicals. Little-known way to help a bee sting: Dribble vinegar onto a paper towel, and press it to onto the sting. Little-known way to remove a stinger: The stinger still pumps venom after a bee sting, so the faster you can remove it, the better. Slide out the stinger with a credit card; your fingers can push the venom in with an accidental pinch. Biggest pet peeve: Slow drivers. I have tens of thousands of bees in my car, people. 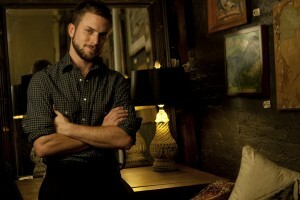 Noah Wilson-Rich gives the buzz on sustainable beekeeping practices. 1. Take a beekeeping course. You’ll not only learn how to become a beekeeper, but also become part of a community and a greater network. For example, the Barnstable Academy in Cape Cod offers classes on how to breed local queen bees instead of importing them. 2. Join your local beekeepers association. Unless you want to do research, you don’t necessarily need a background in science or biology. In fact, most of the people in the New York City Beekeepers Association are lawyers. 3. Remember, this isn’t a cheap hobby. Visit BestBees.com to learn more about the Boston screening of “Vanishing of the Bees,” a documentary film about honey bees, their importance, and their baffling disappearance, on June 23. 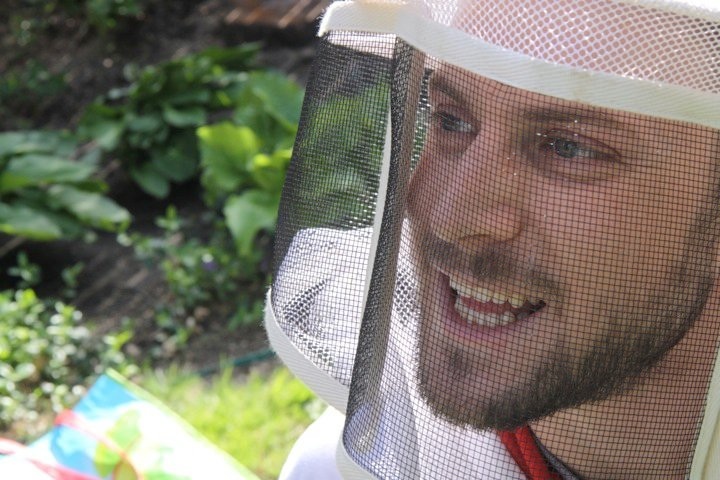 This entry was posted in Crazy jobs, Outdoors Week, Volunteer opportunities and tagged apivax, barnstable academy, beekeepers associations, best bees, boston, cape cod, honey bees, lady gaga, noah wilson-rich, vanishing of teh bees by Megan Hess. Bookmark the permalink.